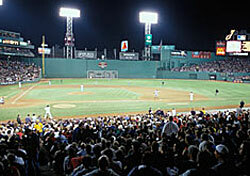 Spring and summer tend to mean one thing in Boston: baseball season. Now that the curse has been reversed, there’s no better time to visit Beantown and become an honorary member of Red Sox Nation. But Boston is not only about baseball—the city offers plenty of other outdoor activities and events during the summer that are either cheap or free. If you’re flying to Boston’s Logan Airport, try to snag a deal on one of the low-cost carriers that serve the city, such as AirTran, Song, or JetBlue. If you plan in advance, you can sometimes find sale fares from East Coast cities for as little as $29 one-way (Independence Air from Washington Dulles) and from West Coast cities from $85 one-way (JetBlue from Oakland). Students should also check with a student travel agency like Travel CUTS, STA, or StudentUniverse for deals. For travel from nearby cities such as New York and Philadelphia, look for cheap tickets on Chinatown buses, Greyhound, and Amtrak. Accommodations in Boston can be pretty expensive, but there are a few hostels for budget travelers. Popular hostels include the Hostelling International locations in the Back Bay (12 Hemenway St.) and Kenmore Square (575 Commonwealth Ave.). Rates start at about $32 per person per night for dorm beds. Summertime visitors will find plenty of free attractions and events going on in the city. For instance, why pay for live theater when you can get Shakespeare for free under the stars? This summer, the Commonwealth Shakespeare Company performs Hamlet on the Boston Common most evenings between July 16 and August 7. It’s not hard to find a free concert if live music is your thing. Throughout the summer, you can catch concerts and other performances at the Hatch Shell, Copley Plaza, and the Boston Waterfront. Grab a copy of local arts and entertainment publications the Boston Phoenix or the Improper Bostonian to find music listings. Both publications can be found for free in news boxes located around the city. The granddaddy of all free outdoor concerts takes place on Independence Day. Boston’s annual Fourth of July celebration on the Esplanade alongside the Charles River features a concert by the Boston Pops Orchestra and a fireworks show in the evening, plus other performances during the day. Hundreds of thousands of spectators show up for the event, so be prepared to get up at the crack of dawn if you want a chance at a prime spot on the Esplanade lawn. If you arrive late, you can still get a good view of the fireworks from the other side of the river in Cambridge. No matter when you visit, you can spend hours exploring this pedestrian-friendly city by foot. Walk or bike the 17-mile trail around the Charles River or stroll through the Public Gardens for a bit of exercise and sightseeing all in one. You can also get your cardio by window shopping up and down boutique-lined Newbury St. Shopping fiends can also get their fill at Faneuil Hall Marketplace. Let your inner child out while you quack through town on a Boston Duck Tour. Renovated World War II amphibious landing vehicles, called “duck boats,” take visitors all around Boston before plunging into the Charles River for a short cruise that affords spectacular views of the city. Tickets are $25 for adults and $22 for students. Of course, a trip to Boston wouldn’t be complete without a visit to famed Fenway Park, home of the 2004 World Series Champion Red Sox. Game tickets have been hard to come by this year, but you can easily arrange for a behind-the-scenes tour of the ballpark for $12 per person. Tours start hourly between 9 a.m. and 4 p.m., or until three hours before game time, seven days per week.